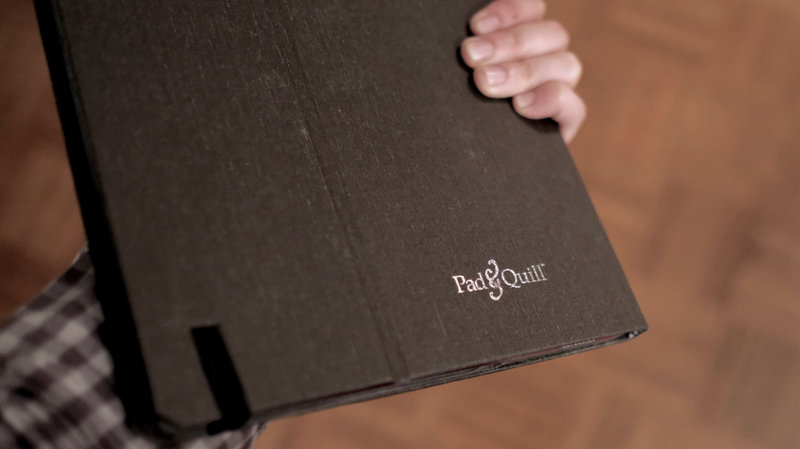 The exclusion of the classic Pad & Quill wooden frame enables an overall lighter design. This on its own isn’t a huge deal, since the full sized iPad Pro weighs enough that you are not really going to grip it in one hand. However, the Contega Thin also has a smaller footprint, which means that it fits into most any slot that would otherwise accommodate a 13-inch laptop. If you’re worried about a large iPad case requiring a new bag, you’ll find the Contega Thin to be accommodating choice. However one of the features I was most interested in was the Smart Keyboard compatibility. Everywhere my iPad Pro goes, the Smart Keyboard goes with it. I definitely missed using hardware keys when I took a few weeks to review the Contega Linen, and I was looking forward to seeing how these two covers would mesh. As it turns out, the Smart Keyboard works well with this case while on a desk. Everything feels like business as usual there, and although there’s a bit of extra folding involved, I love that the Contega Thin can actually enclose the keyboard safely during storage. What the Contega Thin + Smart Keyboard enables is much more comfortable couch typing. The Smart Keyboard doesn’t have enough support on its own to prop the iPad up when you have the iPad Pro in your lap. The tablet always feels like it’s in danger of falling backwards, or simply tipping forward and falling on my fingers. 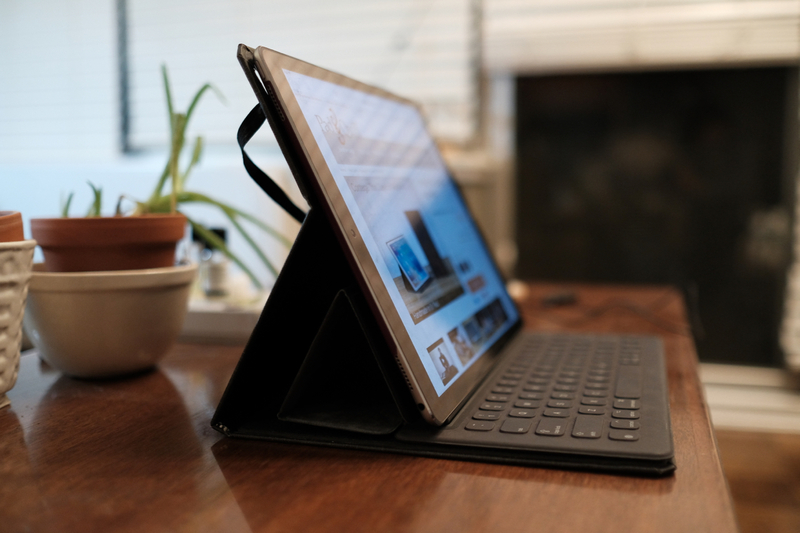 The Contega does a good job of tilting the iPad up higher and making the keyboard more stable. There is also a little bit of flexibility to adjust the screen angle by sliding the keyboard forward, but there is a limit. If you pull the keyboard too far forward, the magnets for the Smart Connector detach, and you’ll lose keyboard functionality. There isn’t an elegant way to tuck the Smart Keyboard behind the iPad Pro when you’re not using it, though, so you’ll just have to leave the keyboard on the nearest countertop if you just want to read for a while. The Contega Thin was designed to accommodate the Smart Keyboard in laptop mode or for quick storage, but not for any other use case in between. 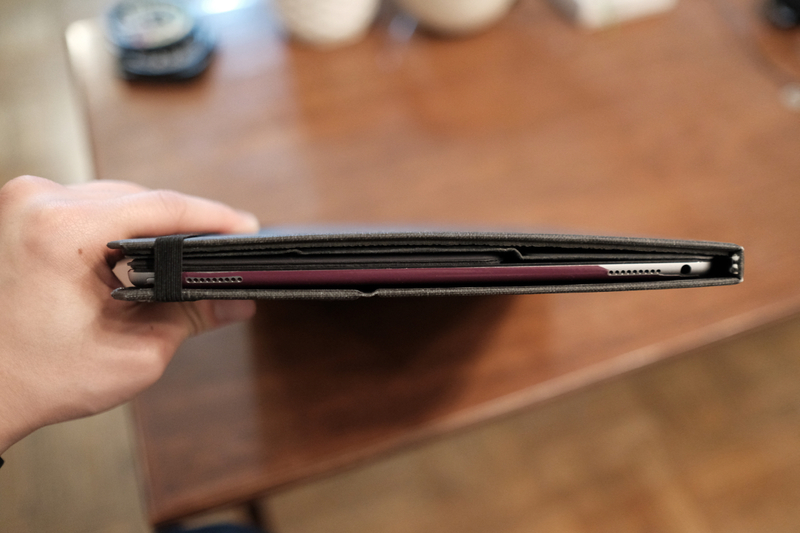 Of the two Contega cases that Pad & Quill sent over, I definitely prefer the Thin design. I like that the iPad Pro still fits in the same bag pockets as before, and I really like that I can use it alongside my trusty Smart Keyboard. The only things I really wish this case had was a more reliable built-in stand and an option for storing the Apple Pencil. 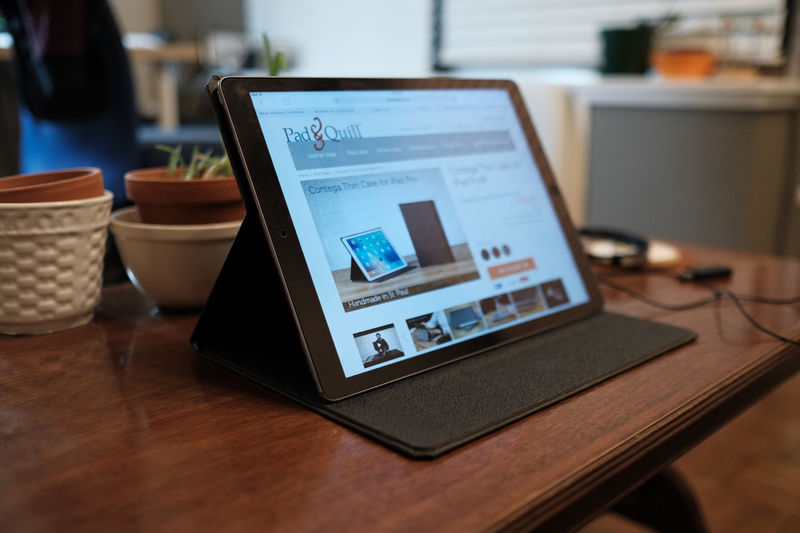 I mentioned the former in the Contega Linen review, but there are instances where the iPad can slip out of its viewing stand and end up falling on its back. This happened a lot less with the Contega Thin because I used it 90% of the time with the Smart Keyboard, but it is still an issue with the basic stand design. I’d also love to keep iPad Pro, keyboard, and Pencil in one package, and although I can tuck the Pencil into the case’s elastic band while closed, this just hasn’t worked out as a secure storage method. If Pencil storage is important to you, then this could be a reason to consider a different case. 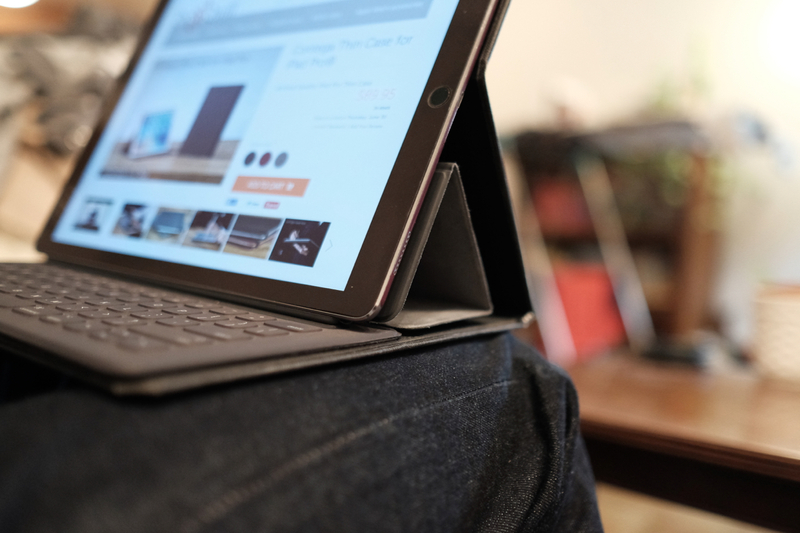 However, if you’re an iPad Pro user looking for a beautiful case to complement your Smart Keyboard, the Contega Thin is a great, flexible solution. I have been using the Conttega Thin case with my 9.7″ iPad Pro Keyboard for a while now. It works GREAT with Apple’s Keyboard, for the reasons mentioned in the article. Without the keyboard attached, however, the Contega Thin case doesn’t hold up. The iPad does not have enough support to stand on its own. The little “bumpers” were designed to prop up the iPad at two different angles, but they aren’t sturdy enough to keep my iPad in place. I’ve resigned myself to ALWAYS keeping the keyboard connected while using the Contega Thin case, it’s the only way my iPad stays upright and protected.